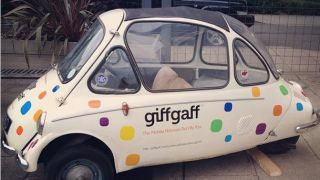 GiffGaff's new motto: "We now do phones!" Community run network GiffGaff has started selling phones for the first time in its three year history, with 20 handsets available from the word go. Up until now GiffGaff had only ever offered SIM-only deals to customers at competitive rates which were actually cheaper than O2 - the network it piggybacks on. The network's CEO hinted that GiffGaff may start selling phones during an interview with TechRadar in 2012, but at the time the iPhone was the only viable handset. Things have clearly changed though, and customers can now pick up the likes of the Galaxy S4, HTC One, Nokia Lumia 925 and LG G2 from the carrier - although interestingly Apple's range is missing from the initial line-up. As well as having the option to purchases handsets SIM-free and unlocked upfront, you can opt to get a phone on finance, paying between £50 and £200 upfront and then paying off the remainder over a series of months - from six to 24 months. Opt for the finance option though and you'll end up paying more for the handset. Take the Galaxy Note 3 for example: it's £599 SIM-free but if you choose finance you'll end up paying between £626.36 to £653.36 for the same phone. In terms of upfront costs the HTC One and LG G2 can be picked up cheaper SIM-free elsewhere, but GiffGaff has the Galaxy S4 at one of the lower prices around at £474. The full line up of phones: HTC One, LG G2, Nokia 301, Lumia 520, Lumia 925, Lumia 1020, Lumia 625, BlackBerry Q10, Samsung Galaxy S3, Galaxy Fame, Galaxy S4 Mini, Galaxy S3 Mini, Galaxy Note 3, Galaxy S4, Galaxy Young, Sony Xperia SP, Xperia Z1, Xperia E, Xperia M, Xperia Z.